Aaron Cook Dot Com ™ - Life, Blogging, Money. : What Is A Ponzi Scam? As I mentioned in my previous post, I see a lot of questions online from people asking, "What is a pyramid scam?" But there are also plenty of people asking the question, "What is a Ponzi scam?" So in the same spirit, here's some updated information explaining Ponzi scams, as well as some tips to help you avoid being scammed by one. A Ponzi scam (technically called a "Ponzi scheme") is essentially an investment fraud wherein the operator promises high financial returns or dividends that are not available through traditional investments. Instead of investing victims' funds, the operator pays "dividends" to initial investors using the principle amounts "invested" by subsequent investors. The Ponzi scam generally falls apart when the operator flees with all of the proceeds, or when a sufficient number of new investors cannot be found in order to allow the continued payment of "dividends." The Ponzi scheme is named after Charles Ponzi of Boston, Massachusetts. 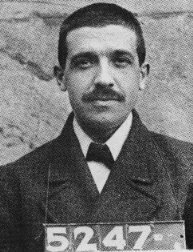 Charles Ponzi once operated an extremely attractive investment scheme in which he "guaranteed" his investors a 50% return on their investment in postal coupons. Although he was actually able to pay his initial investors, his scheme ultimately dissolved when he was unable to pay the investors who entered the scheme later on. As with all investments, exercise your due diligence in selecting investments and the people with whom you invest your money. Make sure you fully understand the investment before you invest any of your money.